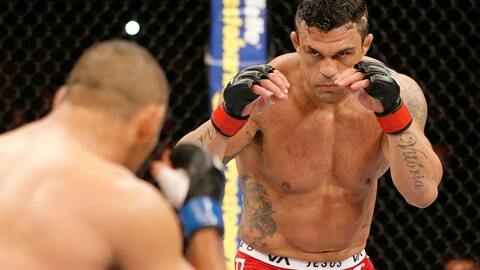 Dana White confirmed that Vitor Belfort will be getting the next crack at 185lb gold. There is plenty on the line when Anderson Silva faces Chris Weidman in the main event of UFC 168. The other wrinkle that was tossed into the fold on Thursday was the fact that no matter who wins at UFC 168, the winner will move forward and face Vitor Belfort next with the title on the line. Even if Silva pulls off a victory, which would even up the series with Weidman, there will be no immediate trilogy. Anderson absolutely thinks Vitor deserves another shot. The next move for him will be Vitor Belfort. According to UFC president Dana White, Belfort has earned the shot at the belt and even Silva – previously hesitant to fight him again after knocking Belfort out nearly three years ago - is on board with the rematch at this point. "(Ed) Soares was telling me that Anderson absolutely thinks Vitor deserves another shot. The next move for him will be Vitor Belfort," White revealed today. The same can be said for Weidman if he beats Silva for a second time, his next challenge will come from Belfort in 2014. "If Anderson Silva doesn’t win this fight, Chris Weidman and Vitor," White confirmed. One other potential bout that’s been rumored recently is the boxing match pitting Silva against multi-time, multi-weight class champion Roy Jones Jr. For the first time maybe ever, White has started to listen to Jones and Silva about this match actually taking place, but it’s not going to happen any time soon and it won’t happen before Belfort gets his title shot if it ever comes together at all. "Let’s just clarify, the match with Roy Jones Jr. is a boxing match. It’s not even an MMA fight if this thing ever came to fruition," White said. "It’s just a boxing match, and it’s not like it would be a 12 round match. These guys want to box." Whether the boxing match ever happens is still a mystery, but Belfort can now sit cage side at UFC 168 knowing that his destiny is already decided, he just has to figure out who he’s fighting for the belt.